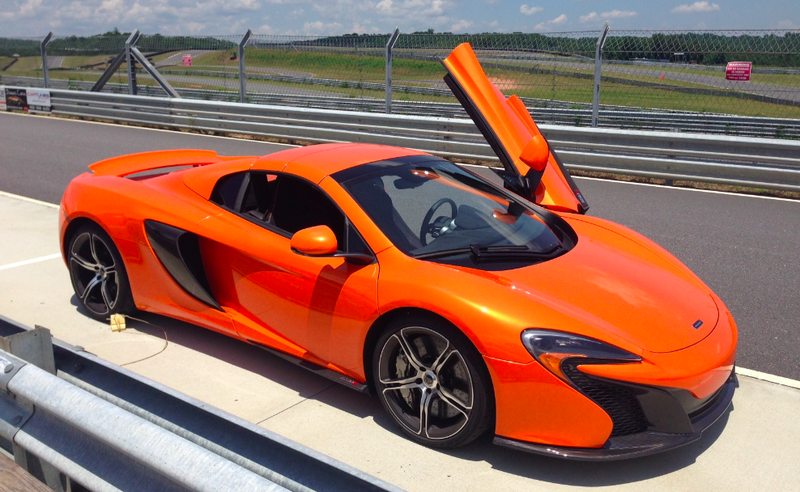 I recently had the opportunity to drive the new McLaren 650S on a racetrack. Here's basically what happened: I put on a helmet, sat down in the car, strapped myself in, and spent the next 15 minutes silently praying I wouldn't hit anything. I also stole a McLaren headsock. So anyway: did I stretch the McLaren's legs? When I went to dinner later that night with my friends, it's all they wanted to know. "What was the McLaren like?" they asked. "Is it faster than a 458? Better than an MP4-12C? More fun than a 911 Turbo? Did you even drive it hard?!" There were a lot of questions. So many, in fact, that I spent some time hiding from it all inside my new McLaren headsock. But the answer is: of course I drove it hard. I sat there for fifteen minutes, belted in to the driver's seat, pushing the 650S as hard as I possibly could. And yet I have absolutely no idea whether it's better than any of those cars, for one simple reason: I didn't get anywhere close to the McLaren's limits. Now, you might be wondering why, in 15 minutes of high-speed track driving, I didn't find the limit of the new McLaren. And here, the answer is even simpler than before: because today's high-performance exotic cars are so fast that they're becoming too powerful for the racetrack. Allow me to explain myself with a little history. About 10 years ago, everyone sort of agreed that exotic cars had gotten too powerful for the road. This happened when Ferrari came out with the F430, which had 500 horsepower, and Lamborghini came out with the Gallardo, which had 500 horsepower, and then Lamborghini came out with a special edition of the Gallardo, which had 560 horsepower, and then Lamborghini came out with another special edition of the Gallardo, which had 570 horsepower, and then Lamborghini came out with another special edition of the Gallardo, which had 550 horsepower, and then the dealers finally informed Lamborghini that yes, they were just as surprised as everyone else that people were still buying the Gallardo, but they didn't need to celebrate each purchase with a new special edition. The way we found out these cars were too fast for normal roads is that people who owned them — normal people, like you and me, except they wear loafers when they drive — told us so. "You break the speed limit in second gear!" they'd chuckle, at Cars and Coffee. "At least I can have fun with it on the track!" But they never actually went to the track, because the track has a strict no-loafers policy. Still, the threat was always there. You can't truly experience these cars on the road, we all thought. But at least you can open them up on a track. In other words, today's crop of exotic cars is absolutely insane. So insane that the thrill is diminishing from track driving for two simple reasons: number one, by the time you've floored the accelerator, it's time for the next turn; and number two, you never really floor the accelerator because you're terrified of the fact that you've got the equivalent of five Volkswagen Jettas mounted behind your head, and you've seen enough YouTube videos to know that you probably can't handle all that, given that your sole qualification for driving an exotic car is that last year set a sales record for your barbecue tong manufacturing company. The funny thing about all this is that modern exotic car owners refuse to admit the cars are too fast for them to handle. They sit around, sipping wine (or, in the case of Lamborghini drivers, snorting cocaine), discussing the performance differences between their vehicles. "My car did 7:20 around the Nurburgring," one will say, proudly. "Hah!" another will reply. "7:20 is for children! Mine did 7:17 without breaking a sweat!" And then the 7:17 guy will sit there, feeling smug, even though neither man would break 9 minutes if they ever actually went to the Nurburgring, and they'd probably both get passed by an automatic Z3. The truth is that today's crop of supercars is all so fast, and all so automatic transmissioned, and so computer-controlled, and so grippy, that they all drive roughly the same. You'll probably never understand the nuances that separate the cars on a racetrack, and you'll certainly never understand those nuances by driving them on the road. Instead, a modern supercar is an emotional purchase: you buy it because you like how it looks, you like how it sounds, you like the interior, or you like how you look inside of it. As for me, I happen to think I look pretty good inside the 650S. Especially when I'm wearing my McLaren headsock.